In the western world, most people probably started off learning the alphabet with ‘A’ or ‘a’ for apple. Should the preliminary curriculum all of a sudden change course by 180 degrees and start with ‘Z’, parents might storm down the schools and government. Consider you lucky, you people who only have to deal with 26 letters of the alphabet plus a few accents aigus, accents circonflexes, and oh that forsaken cédille which is so often butchered by anglophones who don’t deal with any of the above save for the accent tréma which appears only once a year on Christmas cards anyway. You guys have it easy. E-A-S-Y, I say. Having lived in Taiwan until the age of eight, I’ve had the pleasure of suffering through the memorization of two thousand traditional Chinese characters before immigrating to Canada to start third grade. Yes imagine, your six, seven year old writing characters in notebooks filled with four-square grids that span each page with six columns of ten endlessly at a rate of 4 notebooks per semester. Some call it discipline, maybe I do too. Anyhow, I don’t want to bog you down with too much of the details, but strangely enough, at thirteen years later, I still remember the very first six characters I learned. For example, if you wanted to say “small flower”, you’d literally put one and two together to get 小花. In the same way, by putting two and three together you’d get 花生 which means peanuts. Simple? Where 豆腐ck did peanuts come from? It’s supposed to be flower live! But now that’s just talking nonsense, what is flower live even supposed to mean? Maybe the Chinese language does make sense after all those 24 dynasties spanning 5000 years. 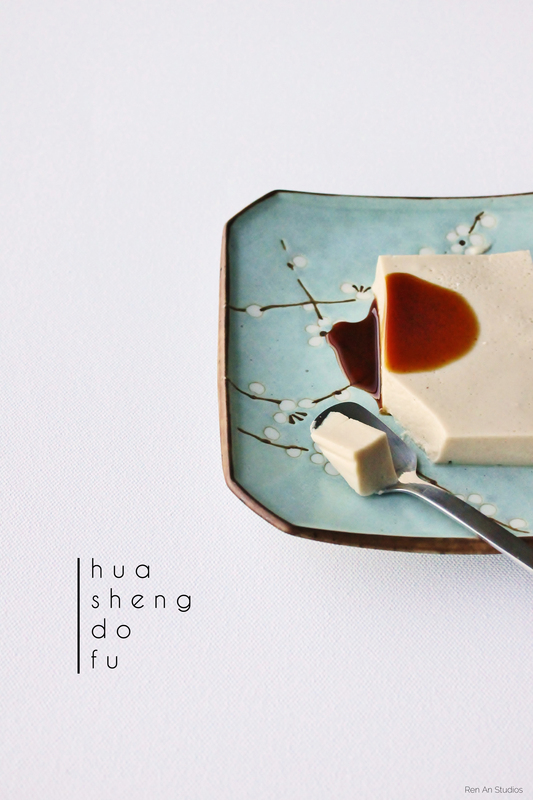 And now we have it, main show of the post 花生豆腐 (peanut tofu). Peanut tofu is one of those things that are unimaginable, there’s no way around it, and I truly honestly do admire whoever came up with it. Its spin-offs, notably black sesame tofu and almond tofu which walks along a sweeter line are undeniably impressive, but nothing quite like the strange, earthy, savouriness you get from the peanut tofu. This is not the traditional recipe which uses a rice flour derived from an indigenous Taiwanese rice with a distinctive sweet aroma and custard-like texture once gelatinized. However, what this recipe does rely on as the thickener is agar powder, a colorless, flavourless seaweed that’s been dried and finely ground. This makes the tofu lighter in texture. The author of the recipe recommends serving the tofu with freshly grated wasabi as well as aged soy paste. Fortunately, the latter is rather easy to come by nowadays in the age of Asian megastores such as T&T; try Wuan Chuang, which has a lovely balance of earthy sweetness and savouriness and can pretty much hold its own. However, obtaining fresh wasabi root is still a challenge. Personally I prefer it without wasabi – what can I say? I’m a purist. To make the peanut tofu, whisk the agar powder and water in a small saucepan over medium heat until dissolved. Put the peanut butter in a blender and blend with the agar mixture until smooth. In a separate pot, whisk the soy milk until hot, but not boiled. Whisk in the soy sauce and salt. Pour the peanut agar mixture into the soy mixture and stir well. Place the pot in an ice waterbath to cool the mixture down as quickly as possible. Meanwhile, brush the inside of a 13 x 9 in. dish with a neutral oil – preferably peanut, to stick with the theme – or simply line the bottom with parchment. Once the mixture begins to thicken, whisk it vigourously until smooth and pour it into the prepared dish. Chill completely for at least 2 hours or until set. Serve cold with soy paste and a steaming cup of genmaicha, enjoy!